Featuring five different milky baths selected for their color and scent. Bath salts are selected especially for the milky water in addition to their various scents and water colors. Each box contains 10 individual foil sealed powders. Choose from one of the largest selection of various Bath Salts like the "Cool" line, the "Hot Springs" or the "Bathclin" line - all imported from Japan. 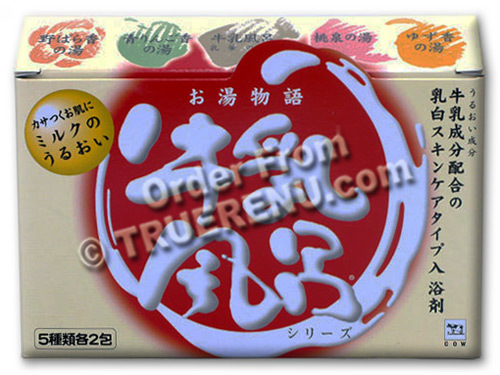 Welcome to TrueRenu and the largest collection of Japanese bath salts available! The Japanese consider bathing to be an essential part of everyday life. A cocoon of hot water relieves stress, and restores balance to the body and spirit. It's no wonder then that so much research goes into developing bath powders that aid in this physical and spiritual healing process. Help ease body fatigue, shoulder and back aches, rheumatism, dry skin, heat rash, eczema, acne, bruises and muscle sprains. Two milk ingredients moisturizes dry skin, leaving it smooth and moist for a long time. Milk Powder: Keeps your body warm long after bathing. Milk Fat: Keeps your skin smooth and moisturized. Promotes blood circulation and helps ease eczema and other skin problems. 2 packs of 5 assorted milky bath salts. Enjoy different bath every night. Milk bath: Milky floral scent; Milky white color Peach bath: Fresh peach scent; Milky pink color Yuzu Citron bath: Whole Yuzu scent; Milky yellow color Wild Rose bath: Wild rose scent; Light milky pink color Green Apple bath: Fresh green apple scent; Milky green color.